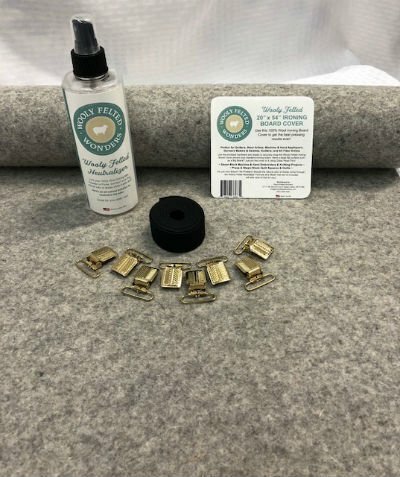 Ironing Mats > Wooly Felted Ironing Board Cover - 20"x54"x1/8"
Wooly Felted Ironing Board Cover - 20"x54"x1/8"
** In order to reduce the number of "one time use and throw away plastic bottles," we provide you with the Mister and Formula, you then mix it up as often as you would like! Use the enclosed hardware and elastic to securely wrap the Wooly Felted Ironing Board Cover around your standard ironing board. Have a large flat surface such as a Big Board? Just pin the cover to it using Glass Head Pins!